They said it was sometime about 4 a.m. on Thursday, December 6, 2012 that an estimated 75 electric utility poles across five Texas counties burst out in flames at about the same time. Fire departments rushed to put out the fires and service workers rushed to repair the damage and restore power to an estimated 20,000 customers that were affected by the phenomenon. The poles serviced customers for Austin Energy, Bluebonnet Electric Cooperative, Pedernales Electric Cooperative, Oncor Electric Company and Hilco Electric Cooperative. Public Safety officials said power poles in Hill, Falls, Bell, Williamson and McLannan Counties mysteriously began burning. Some of the fires involved transformers. Others were just fires on the tops of standard wooden poles that supported electric lines. Burning poles along Highway 6 forced closure of the highway and stopped trains along an adjacent railroad line for about an hour before things were under control. Power pole fires also were reported in Waco, north of Troy, just south of the Falls County Line. Areas of West Waco were out of power after transformers failed. Also the Baylor University campus was plunged into the darkness and traffic lights in various towns stopped working. How did the electric companies explain this peculiar event? They came up with a story, of course. They said the fires may have been caused by a build-up of dust on transformers. Then, during a heavy, low-lying fog that blanketed the area that night, the dust turned to mud, the transformers shorted and burst into flames. 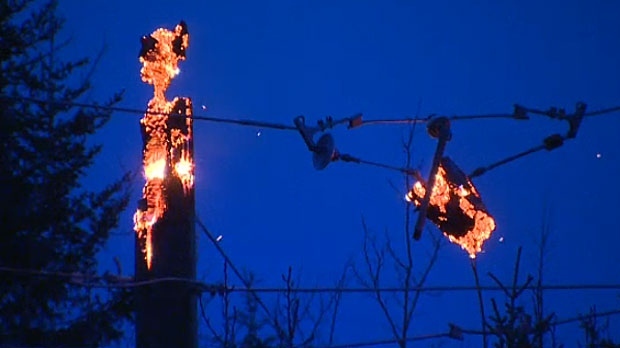 So that might explain the transformer fires, but why did the wooden poles not supporting transformers also burst into flames at the same time? Company officials called it "tracking," caused by moisture, combined with caked-on elements that acted as a conductor. This caused the electricity in the wires to arc and started the poles burning. Power crews were forced to replace the insulators and in some cases rewire power lines where the fire damage was severe enough. The problem with that story is that the aging electric systems all over the United States are operating just like the Texas utility systems. All of them are caked with dust and other "elements" like the ones in Texas. And fog occurs just about everywhere from time to time. If these elements caused all those electric poles to burst into flame at the same time in Texas, why hasn’t that same phenomenon been going on in other places?